Since the cease-fire was implemented in Lebanon, we have heard scattered reports indicating that a prisoner swap with the Palestinians may be in the works. In exchange for hundreds if not thousands of Palestinian terrorists now held in Israeli prisons, IDF Cpl. Gilad Shalit, who has been held hostage by Palestinian terrorists for nearly two months, may be released from captivity. These reports lend weight to the view that things are back to normal. Terrorists kidnap Israelis and hold them hostage and Israel releases terrorists in order to free them. It is a comforting thought for people like Prime Minister Ehud Olmert and his colleagues and the members of Lt.-Gen. Dan Halutz's General Staff who continue to believe that it will be possible for Israel to sign on a dotted line and achieve "a normal existence." Unfortunately, the chance that Shalit will be released is almost as small as the chance that Israel will be able to achieve a "normal existence." Palestinian sources explain that the decision of whether or not to release Shalit is firmly in the hands of the Iranians and Syrians, and they are not in any mood to horse trade with the Jews. Today the Palestinian Authority is nothing more than yet another Iranian proxy. During the past month of war in Lebanon, it was the supposedly moderate Fatah terror group and the supposedly moderate Fatah-led Palestinian security forces that organized mass rallies in the streets of Ramallah and Gaza cheering on Hizbullah and calling for Hassan Nasrallah to bomb Tel Aviv. Now, in the aftermath of the cease-fire, which handed Hizbullah and its state sponsors Syria and Iran the greatest victory in their history, forces in the PA are actively preparing for a new round of war against Israel. As Hamas spokesmen have put it, Israel's defeat in Lebanon has convinced them that it is possible to adopt Hizbullah's methods to destroy the Jewish state. Amid false reports that he was planning to dissolve the Hamas government and replace it with a government of technocrats, Abbas went to Gaza on Monday morning and asked Hamas Prime Minister Ismail Haniyeh if Fatah could join his government. As instructed by his commanders in Teheran and Damascus, Haniyeh has not yet agreed to Abbas's offer. Rather he set humiliating conditions which Abbas must accept first. Abbas already agreed to Hamas's demand that he allow the Islamic Jihad terrorist organization to also join the government. He is similarly expected to agree to Hamas's demands that Fatah join the government as a junior partner and that it abandon its negotiations with Israel. Throughout the Gaza Strip and the Palestinian areas of Judea and Samaria, the Palestinians are gearing up for their next round of jihad with Israel. As was the case six years ago, they are beginning with public executions of Palestinians accused of helping Israel combat terrorism. Just this week, a crowd of hundreds hooted and stomped their feet in ecstasy as unmasked murderers killed one such Palestinian "collaborator" in Jenin. So while all eyes are glued on Lebanon, the Palestinians may well start the next war. And we know exactly how that war will look. They will use missiles, mortars and rockets that they will smuggle in from Egypt to kill Israelis in their homes in the South. They will infiltrate Israeli cities by digging tunnels under the security fence around Gaza, and from Egypt and from towns and cities in Judea and Samaria and murder us in ever growing numbers. They will receive money, weapons and combat instruction from Hizbullah and Iranian operatives in Gaza and abroad and they will attack us while protesting their everlasting dedication to jihad and their anger over Israel's "aggression." Then there is Syria. Syrian President Bashar Assad's address Tuesday was a watershed event. After 14 years of beating around the bush, Syria finally came clean. Peace, Assad said, is dead. We hate Israel and we want to destroy it. If not us, then our children will destroy it. All the Arabs that want peace with Israel are traitors. Long live Hizbullah and we're going to war to conquer the Golan Heights as a first step towards destroying Israel. So Syria is planning to attack us. Perhaps it will do so while Hizbullah is carrying out what Nasrallah called the "building and reconstruction jihad" where with Iranian funding Hizbullah will rebuild Lebanon for the Lebanese and so hammer one more nail in the coffin of the Lebanese nation state and move 10 steps ahead in the Iranian colonization of Lebanon. Yes, while Hizbullah goes forward with Lebanese reconstruction, and with Iranian and Syrian assistance reequips and upgrades its arsenal of war and rebuilds its force structure, Syria will likely open a new front on the Golan Heights. Like the Palestinians, the Syrians will be following the Hizbullah model. Assad knows that his antiquated conventional forces are incapable of conquering and holding the Golan Heights. But, if Israel fights Syria the same way it just fought Hizbullah, then that doesn't matter. Syria, with its arsenal of Scud missiles whose range covers the entire country and armed with its chemical and biological arsenals that can act in the best case as a deterrent force, will be able to kill thousands if not tens of thousands of Israeli civilians and soldiers in the coming battle and cause property and economic damage to the tune of tens of billions of dollars. Syria believes that it will be able to cause sufficient damage to make Israel sue for a cease-fire as we just did with Hizbullah. So like Hizbullah, Syria expects to gain at the UN Security Council what it could never hope to achieve on the battlefield. 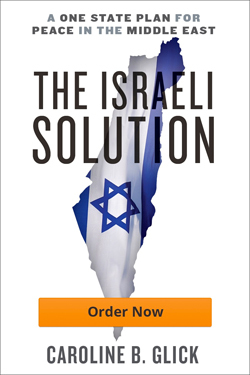 Specifically, given the precedent of Resolution 1701, Syria no doubt believes that in exchange for its aggression, it will receive international recognition for its territorial demands against Israel; an international force on the Golan Heights that will make it difficult for Israel to respond to future attacks; a major upgrade in its international profile; and billions of dollars in international assistance to rebuild in the wake of any damage caused to Syrian infrastructures by IDF operations. Behind the Palestinians and the Syrians lies Iran, the guiding light behind the present jihad. Iran, with its burgeoning nuclear weapons program, is the single greatest danger to international security. It is the single greatest danger to Israel's survival. To date, Iran has made do with fighting Israel through its proxies, to great advantage. But Iran has made it absolutely clear that it intends to join the fray directly – when it is good and ready. And of course it will be good and ready when it has nuclear weapons. If Iran is allowed to attain nuclear weapons, there is no reason to doubt that it will use them. If Iran attacks Israel with nuclear weapons, then of course we are looking at a future war scenario involving not thousands of dead, but millions. As all of Israel's leaders have been quick to point out over the years, the threat of a nuclear armed Iran is not just dangerous for Israel but for the entire world. Iran has its Persian Gulf neighbors in its gun sites. It has directly threatened the US and Europe. Although this is true, the fact that Iran is a threat to the entire world does not give Israel the ability to shirk from its responsibility to contend directly with Iran. Doing so would be tantamount to signing the death warrant of the Jewish people. All of these future wars present us with a clear challenge as a country. We must prepare for war. This means, that technologically, we must engage in a crash program to find means to protect our cities from missile attack. We got off relatively easy this time. Hizbullah chose not to attack our industrial centers but showed it has the ability to do so through its missile attacks near Haifa's port and its attacks near Hadera's power plant. Militarily, we must not relent in targeting our enemies. The IDF must target every Palestinian terrorist. It must reassert control over the international border between Gaza and Egypt. Israel must accept the reality that the PA is a terrorist organization, not a legitimate regime, and stop viewing Abbas and his associates in Fatah as potential peace partners. Obviously, Israel must give up the idea of transferring Judea and Samaria to Palestinian control and take all necessary measures to stabilize the situation on the ground in a manner that neutralizes the threat of Palestinian jihad. Furthermore, the war in Lebanon exposed the results of years of neglect of the IDF reserve forces. These forces must be properly equipped, properly trained for war, and properly led. The talk of releasing men from reserve duty at 35 must be abandoned. The IDF has to accept that it is a fighting force in war. Commanders have to stop acting like yuppies in uniform and understand that they have a war to train for and fight and win. Finally, Israel needs a political leadership that will be capable of telling the Israeli public the truth that has been ignored for the past decade and a half. We are not a "normal" nation and we are not going to get peace in the coming years. We are an abnormal nation in our neighborhood and in the world and will always remain so, as is our right. Our people must be ready to sacrifice for the survival of the state and the defense of our freedom to be abnormal. We need leadership that will tell the Israeli people that a struggle awaits us but that our democracy, our freedom, and our values give us the power of creative thought that will allow us to beat the dull forces of jihad that surround us. In response to Assad's speech on Tuesday, Foreign Minister Tzipi Livni said that Assad has to decide if he's on the side of peace or on the side of war. Defense Minister Amir Peretz outdid even that when he said that now that the war is over, it is time for Israel to get down to the real business of peace and to set the conditions for a renewal of the peace negotiations with Syria. In so responding to Assad's unequivocal warmongering, our leaders again have shown us that they have learned nothing and are incapable of learning anything from the disaster into which they led us with Hizbullah in Lebanon. There is no missile that is capable of penetrating their walls of self-deception and delusion. They are blind and deaf to all evidence that their way of appeasement has failed. With the Olmert government's stubborn insistence that Israel won the war it just lost, with the General Staff's absurd statements that the mission was successful, it is clear that both our political and military leadership must be replaced as quickly as possible. Our enemies give us no time for hesitation. They plan their next wars in broad daylight as our leaders squawk in the darkness of their ideological stupor. Only in Israel could the man who lost a war still keep his job. The country’s political system doesn’t hold any one responsible for failure. Olmert as a result has paid no real price for his destructive policies. What a lamentable state of affairs.